Driven by a strategic University initiative and an expanding individual and collective campus consciousness regarding the importance of sustainability, Penn State Berks will host a number of sustainability-related events leading up to Earth Day, which will be celebrated on April 22. Dr. Mahsa Kazempour, associate professor of Science Education who is directing the Earth Day events, said April’s programs, and other sustainability-related events and activities throughout the year, reflect the increasing importance of environmental issues for the University and the comprehensive integration of Penn State’s Sustainability Strategic Plan into research, teaching, outreach and operation at Penn State Berks. “Last year’s Earth Day activities were quite successful and heavily supported by the campus and our local community. We are building on that this year with what we hope are exciting and engaging activities,” said Kazempour, who is also the leader of the Penn State Berks Sustainability Team. • Wednesday, April 18. 10 a.m. to 1:30 p.m. Perkins Lawn. Earth Fest will feature more than two dozen stations, activities, demonstrations, special events, prizes, and a photo contest. Stations staffed by students, Sustainability Team members, and local organizations will focus on saving bees, conservation internships, endocrine disruptors, the Schuylkill River Trail, Sierra Club, the Penn State Berks Center for Agricultural Sciences and Sustainable Environment, Berks League of Women Voters, biogas, plastic bottle greenhouses, addressing the spotted lantern fly, and other topics. Raffle ticket drawing for eco-friendly prizes will take place at 1 p.m.
• Thursday, April 19. 10:30 a.m. to 3 p.m. Gaige Technology Building Lobby. Students from Kazempour’s three sections of the college’s BI SC 003 Environmental Science course will offer poster presentations of their semester service-learning and community engagement Environmental Awareness and Community Action Projects (EACAP), carried out with the Nolde Environmental Education Center, the City of Reading’s Glenside Elementary School, and Reading’s City Park Permaculture and Greenhouse. • Friday, April 20. 10 a.m. to 2 p.m. Penn State Berks Campus. Kazempour and her BI SC 003 Environmental Science course students will host 55 Glenside Elementary fifth graders for a visit to participate in a number of Earth Day-related activities, including a tour of the Penn State Berks Center for Agricultural Sciences and Sustainable Environment Greenhouse with John Rost, Lab Supervisor for Biology and Horticulture. This is the third year Kazempour is hosting this visit. Penn State Berks commitment sustainability is evident. More than 150 teams have completed environmentally related service learning projects including removal of invasive species and planting native species; the creation of rain gardens; designing rain barrels; developing signage, brochures, and education materials for local elementary schools and environmental centers; cleaning up rivers and trails; helping with the redevelopment of a local school garden; creating educational videos about important issues such as food waste; and building and maintaining owl and blue bird nests. 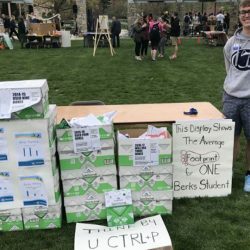 For more information on the Penn State Berks April 2018 Earth Day events, as well as the college’s sustainability initiatives, contact Kazempour at [email protected].